Before you leave, don't forget your walking boots! 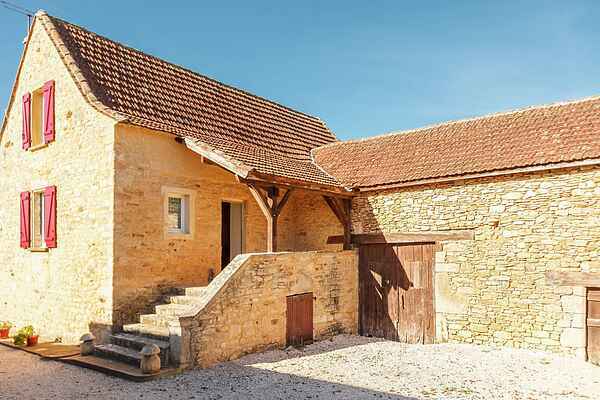 The surroundings of this detached holiday home in Prats-du-Périgord (2 km) are really made for long walks. From the large garden you have a beautiful, panoramic view over wooded hills. Here, the children have plenty of space to play. During the day you can see birds of prey flying overhead and towards the evening you may well see deer coming out of hiding. From here the huge forested area offers endless possibilities for day trips. A nice day out in one of the stunning medieval, fortified towns such as Villefranche-du-Périgord (8 km) or Monpazier, with its beautifully preserved arcade-square (17 km) is not to be missed. You can make another splendid trip via the fortified, hilltop town of Belvès (20 km) to Siorac-en-Périgord (22 km). We can also highly recommend the well preserved town of Sarlat-le-Canéda (38 km). Just like the caves at Les Eyzies (40 km) and the castle of Biron (25), to give a couple more examples of the marvelous local culture.